(Host) When Tropical Storm Irene ravaged the historic covered bridge connecting the quaint business district of Quechee with the rest of the village, the surrounding town of Hartford lost more than a photo op. The local economy depends heavily on the bridge, and voters now have to decide whether to repair it, or build a bigger, longer one. As VPR’s Charlotte Albright reports, supporters of the bond question worry that voters who don’t live near the bridge will turn thumbs down. (Albright) When the waters of the Ottauquechee River began to rise last August, Alex Adler was doubly alarmed. That’s because her house was perched at one end of the Quechee Bridge, and her Parker House Inn and restaurant is at the other end. When Adler heard the water roar and felt her house shake, she and her husband packed their two daughters and five animals into a car headed for the Inn. (Adler) "We crossed the bridge and turned the corner and thought we would be safer up here." (Albright) She was right. The house had to be abandoned, and with help from FEMA and the Small Business Administration, the family has relocated to Hartland. The raging river also destroyed the covered bridge that leads to the businesses and homes in Quechee village. Adler is making repairs to the inn, and hoping business will pick up when the bridge is open again, and people don’t have to go several miles out of their way to get into the village. But she knows rebuilding the bridge will take time. (Adler) "And all the business or people that I used to see every day at my corner store when I get the paper or buy milk, I haven’t seen them at three or four weeks at a time now. You don’t have that sense of community you once had-people really have to make the extra effort to reach out to each other." (Albright) Irene dealt the area a double blow because farther up the river, in Woodstock, the Taftsville Bridge was also destroyed. Its $3 million repair job will be covered by federal, state and local funds. But Hartford chose a different route, which would require the town to come up with a sizable match to money from the Federal Highway Administration Fund. Voters will decide on Town Meeting Day whether to approve a $1 million bond to help pay for a brand new concrete bridge with a wooden cover. Hartford Town Manager Hunter Rieseberg says the old bridge would not have lasted more than another decade or so, even if repaired. (Rieseberg) "We think this is an excellent opportunity to replace the bridge as we would ten or fifteen years from now and use the funding that is available to us to rebuild the old bridge toward the cost of the new bridge." (Albright) FX Flinn, who is running for the Select Board, has worried in his blog that the bond will fail, which is one reason why he used to oppose it. But now Flinn is lobbying for the bond. (Flinn) "The bond is actually the right way to finance this because then it will be paid for over a period of time by people who are actually using it, whereas if we paid for it out of town savings it would be in effect tax payers of the past who are paying for something that will last for 75 or a hundred years." 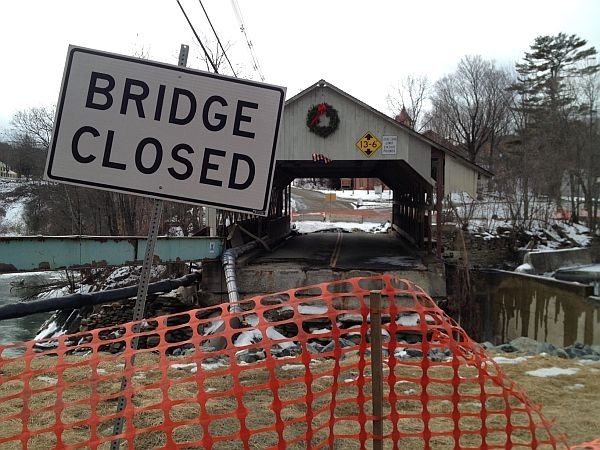 (Albright) If the bond proposal fails on Town Meeting Day, the town will fall back on a less expensive plan to repair the eighty-year-old bridge. The town’s share of that bill would be about $170,000. You can read select board minutes from Hartford at VPR’s Public Post. A Windham County town is planning to mark the anniversary of Tropical Storm Irene by remembering the loss of a local icon – the historic Bartonsville Covered Bridge, which was swept away by floodwaters. Residents in Dummerston will have to wait a little longer for repairs to a landmark covered bridge over the West River. Officials have had to put the work on the 140-year-old covered bridge out to bid again.